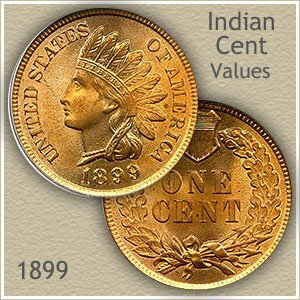 1899 Indian head penny value is above $9 when your coin is only moderately worn. The amount of visible design remaining is very important to value. Condition is key to how much your Indian penny is worth. Old pennies that circulated to the point their design is only an outline are worth in the $1 to 2 dollar range. Look closely at the headband on you coin, just above her eye. If parts of "LIBERTY" are visible the coin is in better condition than most and of higher value. Pictured is an 1899 Indian penny in "uncirculated" condition, this coin never entered circulation and fortunately remains as minted. You can see LIBERTY is clearly visible as part of the headband. Rare in this condition and considered the most desirable as a collectible, values can reach into the hundreds of dollars. Auction results and images of one the finest know 1899 pennies is detailed below. 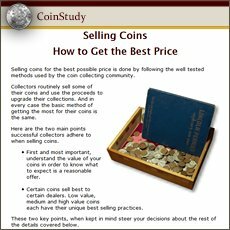 You can determine the value of your coins. Just after the value chart see the section on "grading" the condition of your coin. 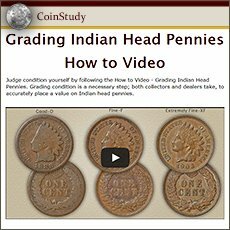 By careful examination and comparison to the grading images you begin to close in on an accurate 1899 Indian head penny value. It is a step by step process for each of your coins. Of the millions minted, pictured is an 1899 Indian penny considered one of only a few hundred surviving in gem quality. The fast majority of these pennies were released into circulation and quickly the original luster and mint freshness was worn and tarnished. To the delight of today's collector it was carefully handled and kept secure from the elements. Not only is this coin "uncirculated" there are minimal abrasions and the strike is full and crisp giving it the appearance of being minted yesterday. Bright luster glowing red and gold with hardly and imperfections it was well received by bidders at a David Lawrence Rare Coins auction. A true gem example raised the value of rare 1899 pennies to $425. 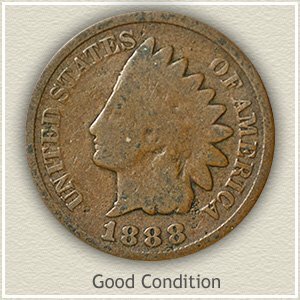 Your 1899 Indian head penny value may not reach the level of the top tier examples, however in nice condition with minimal wear it is welcome to many collectors. Judging a coin’s state of preservation is known as "grading" by dealers and collectors. How well your coin has survived and the amount of wear to its surface determines value. By using key elements of the design you can judge the extent of wear on your coin. Remember, few of these old Indian pennies remain in above average condition today, examine each closely. Uncirculated: Shortly after minting, this 1899 penny was put away and never used. You coin may have toned a brown color and is no longer the bright red when first minted. However, the highest parts of the design have not been disturbed by wear. The first to exhibit abrasions is hair above the eye and curls behind her neck. Check the Indian‘s cheek, hair and ribbon below her ear and the tips of the feathers. If there is any wear, these areas show a smoothing to the surface and the original luster is disturbed. Extremely Fine: Sharply defined details, including the finer elements, describes an Indian penny in "extremely fine" condition. Looking closely at the head band, all letters in LIBERTY are fully separated. Slight wear is present overall, however all parts are bold. Your coin should stand out as very pleasing to the eye and highly detailed. 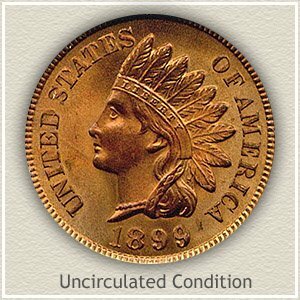 Fine: As a collectible coin, 1899 Indian head penny value is generally double a lesser grade example. Moderate wear with ample detail remaining is the appearance of a "fine" grade penny. Wear has reduced the highest details considerably but not to the point of merging one into the other. The ribbon behind her neck is still separated from the hair, although worn smooth as it crosses. Good: 1899 pennies in "good" condition are still considered a beginning collectible grade. Although worn to almost an outline, her portrait still shows slight detail. The lettering and date along the rim is clearly visible but in shallow profile. If your coin has avoided any serious dents and nicks and is not any worse than just described, it is considered solid for the grade. 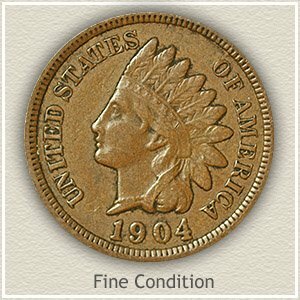 Additionally, if a small amount of roundness is visible to her face your 1899 Indian head penny value is slightly higher. $1 to $2 for common dates. Today many advanced collectors are pursuing Indian pennies causing rare dates to rapidly move higher in value. Better condition coins are especially sought. Your box of old coins has never been as valuable. Additionally, realize a better price if selling and finding coin buyers, when you have a good idea of accurate values.